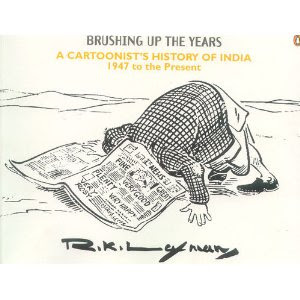 A drive through India's political landscape over the past 60 years, as seen and drawn by RK Laxman, possibly India's most famous cartoonist. The selection, at over 300 cartoons is good, but still cannot do justice to Laxman's genius, and some notable cartoons are conspicuous by their absence. 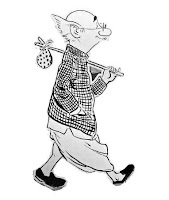 RK Laxman's satire is never malicious, yet always succeeds in conveying the point across. Looking at the cartoons, you also get some insight into Laxman's political views themselves. Despite his wicked jabs at the establishment, Laxman remained more or less a Congress supporter, looking askance at the efforts by opposition parties to stitch together a united coalition against the Congress' rule. He continually viewed the communists, or the Left, as an anachronism, and a party caught in a time warp, opposed to modernization and economic liberalization. His cartoons stood steadfastly against religious communalism, and has been harsh towards the likes of LK Advani, the BJP leader, or towards Bal Thackeray, the Shiv Sena supremo, and who ironically, is a cartoonist himself, and had worked with Laxman in the 1940s! With economic liberalization coming in, one cartoon shows Mahatma Gandhi walking down Mahatma Gandhi Road, surrounded by logos and banners emblazoned with such brands as "Mac Donalds", "Coca Cola", "Pepsi", "Kellog's", "Arrow", "Woolworth", and more. On the liberation movements in Goa and Pondicherry - the colonial powers are depicted as simians rampaging in a house, with whom Nehru is pleading to vacate the house (India), explaining that while the entire world was a colonial jungle once, the world has now changed. This is followed by an equally trenchant, yet 'silent' cartoon - not containing a single word - where Nehru is seen dropping a dead rat into a dustbin; the rat being the Portugese, who were evicted from Goa in 1961 by the Indian military forces. The punchline, so to say, is seen as the horrified expression on the faces of several people in suits, supposedly representing colonial sympathizers. The common man is also India's own superman. A cartoon from 1969 shows the common man as the answers to the Indian space program's search for a person as someone who "... can survive without water, food, light, air, shelter!" Several cartoons are devoted to the period during the Emergency (1975-1977), and then of the Janata Party rule. Indira Gandhi is carrying a placard that says, "I toppled Janata govt." Raj Narain is seen remarking to Charan Singh in the background, "That's a lie! Everybody knows we worked for two years and brought it down." --- The extent to which the political class had become alienated from the history and ethos of India's independence is reflected in a cartoon around the time the movie Gandhi was released. A politician is seen coming out of a screening of Gandhi, remarking, "Very moving. I understand it is a true life story." Pages 101 onwards have several cartoons from 1984 and 1985, covering such topics as Indira Gandhi's assassination and Rajiv Gandhi's ascension to prime minister-ship. The tone of Laxman's cartoons on Rajiv Gandhi reflects the popular sentiment and overwhelmingly sympathetic attitudes of the people towards Rajiv Gandhi - seen at the time as a honest politician trying to clean up the system. Laxman's pocket cartoons, "You Said It", start to make their appearance from page 166. These are generally more general in nature, and rarely feature any political personality, even though they do cover topics and personalities of the day. One of the most poignant and saddest cartoons in the collection is on page 120. A woman labourer is carrying a load of construction material on her head, while carrying a toddler in her lap at the same time, who is also carrying a similar sized load over her hears. The mother is admonishing the child, "Learn to balance it properly, silly girl! Remember, soon you will have to start working." Seen in the background is a banner proclaiming the celebration of International Women's Day. With over 500 million telephone connections in India today, this cartoon is a reminder of the absolute mess that the Indian telephony monopoly was, run as it was by the Indian government. A person manning a desk replies to a person, "Yes of course it works. It worked on May 4th, June 21st, and again on the second of this month." One of the most famous cartoons, that Laxman drew in 1990, is one that shows VP Singh, the then Prime Minister, in progressively diminishing sizes, but with the size of his cap remaining the same - a reflection of VP Singh's Mandal card, that (re)introduced the monster of caste-based politics and reservations into the social fabric of India. Cartoons at the beginning of the 1990s feature Narsimha Rao, and his (in)famous indecisiveness. VP Singh makes his appearance on page 109, as the finance minister in Rajiv Gandhi's cabinet. The infamous Bofors scandal makes it debut on page 130. Arun Shourie, India's finest journalist and possibly her most efficient minister, makes a lone appearance on page 270, on a cartoon on the rapid pace of disinvestment under the NDA government.